Marienplatz U-Bahn station. It's a favorite amongst photographers for its symmetrical lines and eye-popping color. I got to visit Munich with some friends while on a Europe tour with Contiki in 2010. We stopped in the city for a night, coincidentally during Oktoberfest. We spent the afternoon checking out sights around the city. We decided to catch the U-Bahn to Marienplatz, one of the main areas, then took a walk around. Marienplatz had a lot of well known buildings. After exiting the U-Bahn around the Square, we roamed around and came across buildings like the Frauenkirche as well as a bunch of interesting shops and delis. Keep in mind that there is not much English anywhere, so it may slow you down like it did us. The biggest issue that we had was figuring out the U-Bahn subway system because there was no ticket gate, meaning you can technically ride the subway for free - as long as you don't get caught. It's a sort of honor system, and if you are found without a ticket when randomly checked, there are steep fines. The same goes for other cities like Berlin. You're supposed to buy a ticket, put it in your pocket and ride. 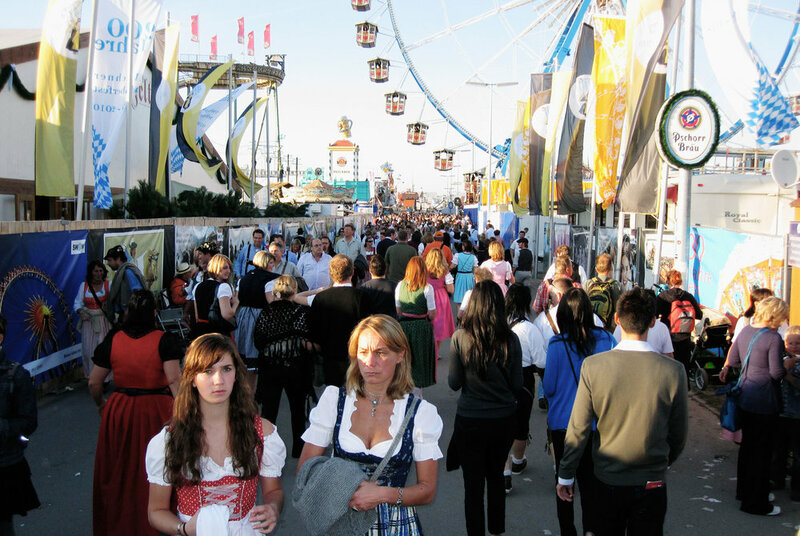 In the evening, we headed to Oktoberfest. We were incredibly fortunate that it happened to be the 200th anniversary of the festival, meaning it was a pretty big deal. Oktoberfest lives up to the hype; it's a full on carnival slash circus-type of affair, full of huge tents packed to the brim with people drinking beer, singing and having fun with everyone around them. We peeped into a few different tents to take a look and compare, but realized that if we could find a seat at any one of them, we might be better off just staying put. Each of them holds at least few thousand people and were all packed. Our third tent was the Munich-native Hofbräuhaus, one of the largest there. It took us a while to get seated, and there was only room in the standing area. Beer women came by every now and then taking orders, but you might have to be a bit aggressive to get their attention as it's crowded and everyone is talking and having a good time with the band also playing on stage. Those beer women come back with an armful, quite an impressive armful, of glasses for you. 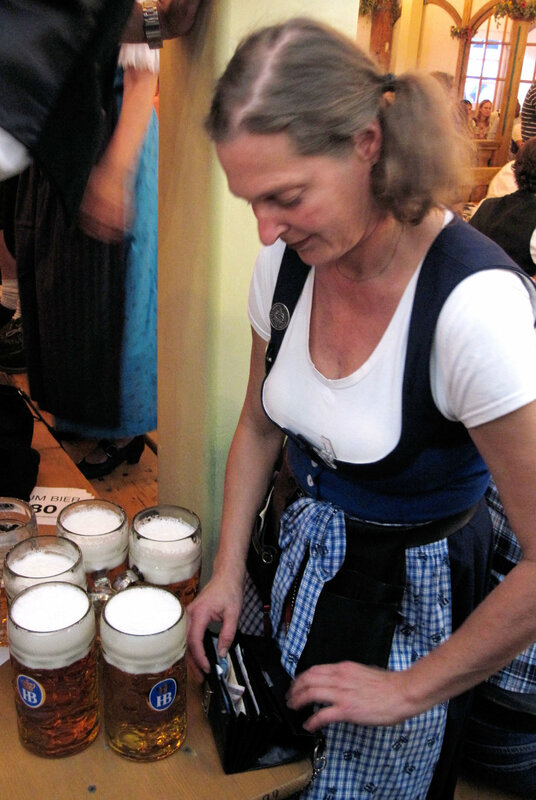 One of the best things about Oktoberfest though? So much beer and fun and did not even see one scuffle or fight. 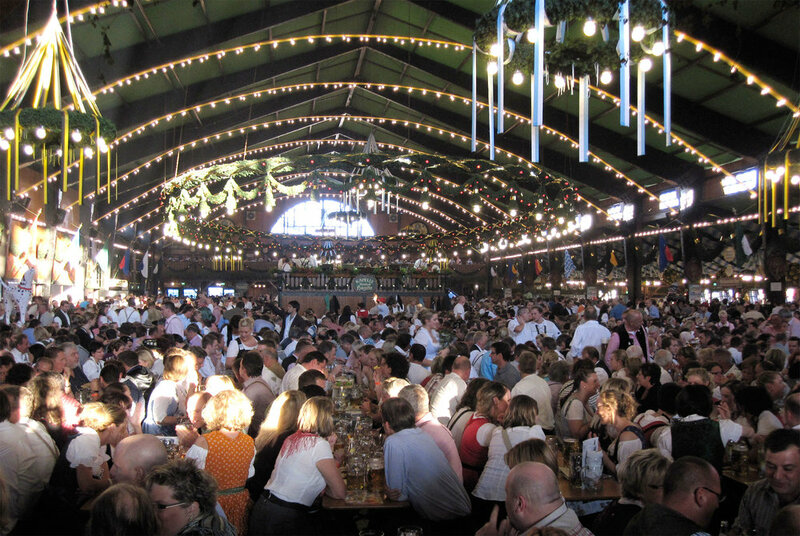 If you can time a trip to Munich during Oktoberfest, I highly recommend it, it's a good experience.